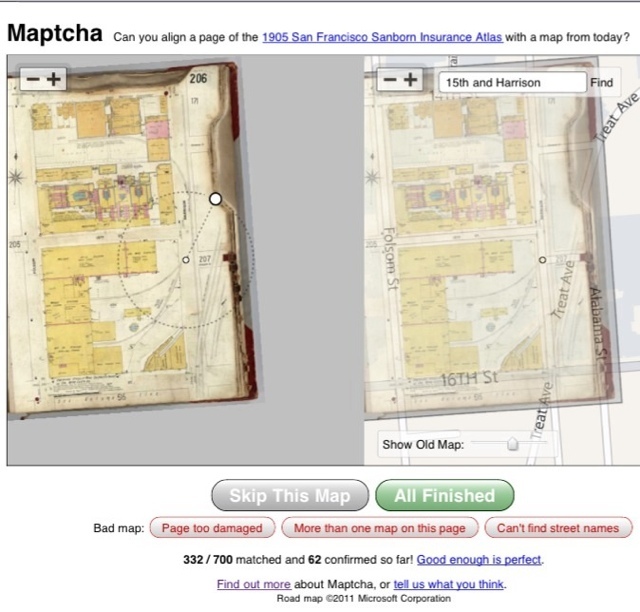 Did a fun little interview on KQED about the 1905 Sanborn fire insurance maps and the geo-location alignment tool that Mike from Stamen was kind enough to build. The easy part is done — the maps that are left are the tough ones, where streets were renamed (or never actually existed). Bayview / Hunters Point (aka Butchertown) along with the old piers by Dogpatch will be a real challenge. Lettered streets were expanded into words (N St South became Newhall St.)and numeric order turned into alphabetical street names (11th Ave South became into Kirkwood, 12th Ave S. turned into La Salle). Railroad Ave (and the Long Bridge) eventually became 3rd street. Freebooters and cutthroats, these Spanish fellows! What do we want with Spanish names, anyhow? Why, only the other day they shot a man there for speaking out the truth, and they have been the most cruel; tyrannical race In Europe. Let’s go back to Ireland, if we must get some names imported. ‘Dinan’ and ‘Conroy’ will do better than these outlandish titles of forgotten adventurers. This Spanish business is worse than the bubonic plague, but we’ll come through it in time. The 11/27/1909 SF Call tells the story of a pirate mistaken for a priest (Sir Francis Drake vs St. Francis of Assisi). More SF Call articles for your perusal on the ever awesome California Digital Newspaper Collection. Consider throwing them a bone – all that scanning isn’t free. Congratulations on your new fame! The Richmond/Sunset streets that are named now were actually lettered, not numbered. Judah was J Street, not 10th Avenue (which is still 10th Avenue). The only numbered ones that were renamed there were Arguello (former 1st) and Funston (former 13th). For more numbered streets, though, there is the 1854 Official Map, which called Polk “West First Street” and kept on numbering west from there. Julian and Albion were also 1st and 2nd Avenues in some 1850s maps that I can’t find right this second. Whoops! Thank you for the proofreading – been staring at too many Butchertown maps. Your interview inspired me to spend about an hour of my workday matching up maps with the Maptcha. Don’t tell my boss. Patience, grasshopper! The alignment is but the first step in our journey. Another name change tip: Point Lobos is now Geary Avenue. I didn’t realize until today that Point Lobos was Geary, and I was outraged, my first thought was a ballot initiative to restore the original. They also changed Japan and China Aves to Avalon and Excelsior — there is something kind of pleasantly 40s about those names, like if we happened to have a street named Breivik and had to rename it to something and chose iAvenue. If it makes you feel any better, a little nibblet of Point Lobos still lurks between 39th & 48th. Funny, I just noticed the Japan and China Aves today. Should be interesting to see what streets get renamed over the next 106 years. That does make me feel much better, I keep learning today. I didn’t even realize that Geary changes names at that point, and I am pretty attached to that area. We must have all been assigned the same problem maps because I got a crash course on Butchertown and other spots of SE shore right as you were researching and posting this, as well as one at Point Lobos and 15th Ave.
BTW what is the status of BurritoVision? Do you have any other ideas for apps you’d like to see? There was another Japan Street too, the current Colin P. Kelly. That one was renamed during World War II, and I think was probably the first honorary street naming to use someone’s full name. Regarding BurritoVision, I see two steps. First would be a simple version that takes any one georeferenced map and displays and rotates it based on your location and direction. We could theoretically do this using the Sanborn.maptcha.org placements. BV would figure out your location, see if there is a map available, determine the direction you are pointing, and rotate the image dynamically. Step 2 would be displaying a tiled or carpeted map set. Same display as above, but we need to crop and glue the maps into a carpet first (to rotate around 24th and Mission, we need four different maps. We should discuss this over beer sometime. Name changes are especially interesting! Racism, misguided patriotism and other sad -isms shakes things up even more. 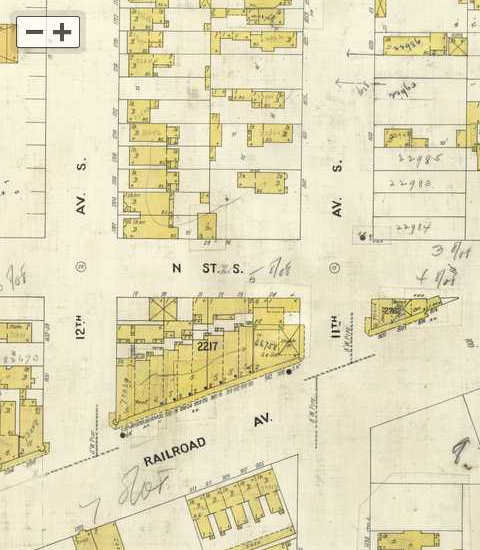 My favorite of the three alphabetized street sets (that I know of) in Sunnyside ends at Genessee, but used to contain an H street, which was changed to Ridgewood during the War. (II) It was Hamburg. The San Francisco Public Library digitized these reports with the Internet Archive. Another area where streets today are different from when they were originally platted is Diamond Heights. The rectilinear Noe Valley street grid was planned to extend up over Diamond Heights and down into Glen Canyon. There are still some vestiges. The block of Goldmine east of Diamond Heights was Valley Street.